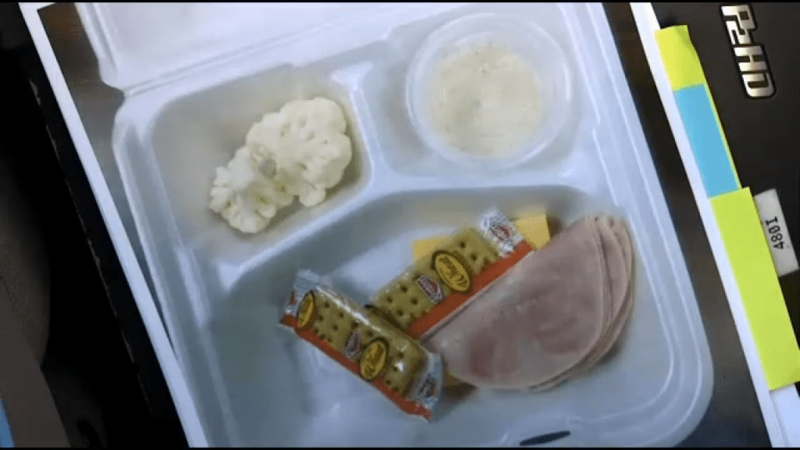 An Oklahoma student has sparked outrage about federal school lunch guidelines after taking a picture of her meager lunch. Kaytlin Shelton’s lunch consisted of a few slices of lunch meat, a slice of cheese, two small packages of crackers and two pieces of cauliflower. The lunch is particularly small for Shelton, 17, who is eight months pregnant. Shelton’s father, Vince Holton, called the $3 meal “ridiculous” and insufficient for his pregnant daughter. “I can go pay a dollar for a lunchable and get more food in it,” said Holton. “It makes me want to take that and take it to the Superintendent and tell him to eat it for lunch,” said Shelton. “Decisions should be made by communities, parents and students,” says @DarenBakst. No exceptions to the guidelines are made for pregnant students or athletes who need more calories. Assistant State Superintendent for Child Nutrition Joanie Hildenbrand told KOKH-TV the district is “still struggling” with the federal regulations put in place two years ago. “The primary focus of the program should be that kids actually eat,” said Bakst. He said school officials know there is a problem but their hands are tied.